If you are up for a healthy meal with plenty of rice and seafood dishes, then go Japanese. This cuisine offers a huge variety of dishes and regional specialties. Japanese cuisine is known for its seafood, vegetables, and rice. Raw seafood chopped with a sharp knife has long been a distinguishing feature of native Japanese food. Principal seasonings are fermented soybean and rice products, such as soy sauce, “miso (soybean paste)”, and rice vinegar. To preserve the natural flavors of ingredients, strong spices are avoided in favor of milder herbs and spices, such as “yuzu (citron)”, “wasabi (Japanese horseradish)”, “myoga (ginger)”, and dried and ground “sansho” seeds. Rice is Japan’s most important crop. It has been cultivated there for over 2000 years. The value of this product in Japan is emphasized by various factors: it was even used as a currency at one time. The Japanese word for cooked rice (gohan) also has the general meaning of “meal”; the literal meaning of breakfast (asagohan) is “morning rice”. Japanese rice is short grain and becomes sticky when cooked. Many different kinds of fresh fish and seafood are served raw in traditional Japanese dishes. Sushi is the most famous such dish outside of Japan, and one of the most popular dishes among the Japanese themselves. It is usually served on special occasions. Sashimi is also popular inside Japan, but not so well known abroad. While similar to sushi, sashimi is distinct for its absence of vinigered rice. When slices of fish are served on top of a small ball of rice, it is called nigiri zushi. Seaweeds have been an important part of Japanese cooking for many centuries. Today, various types of seaweed are used extensively as soup stock, seasonings, and other forms in daily Japanese cooking. Three most commonly used types of seaweed are: Kombu, Wakame and Nori. Since the late 90s, Japanese cuisine began to gain popularity in Moscow. The first Japanese restaurants began to appear in Moscow around that time, such as Planet Sushi in 1999. The number of Japanese restaurants in Moscow has quadrupled since then; there seems to be no end to the increasing popularity of Japanese food in Russia. Along with the restaurants, Japanese culture has been blossoming in Moscow. It has became fashionable to go to Japanese restaurants; such Japanese authors as Haruki Murakami and Yukio Mishima have been breaking sales records in the book stores. 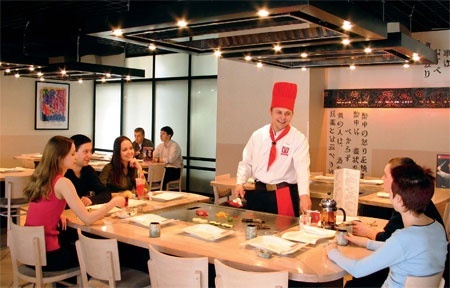 In 2001, being sensitive towards market trends, Rosinter (Rostik Group Corporation) was awarded the exclusive franchise rights of “Benihana of Tokyo” restaurants in Europe. Benihana of Tokyo is a very famous chain of restaurants that has over 70 outlets worldwide, mostly in the USA, England, Australia, and Japan. In Japanese “Benihana” means “red flower”. 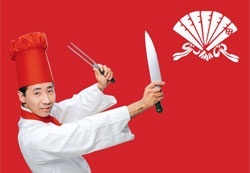 It is believed that red fl owers brings luck; so all the chefs at Benihana wear red hats. The founder of Benihana, Roki Aoki opened his first Benihana restaurant in 1964 in New York. At the time, Japanese cuisine was not something Americans knew an awful lot about.. The idea of cooking food right in front of the guests was totally unknown, yet it quickly gained popularity. What started as a small place with four tables in New York later grew into an international symbol of wonderful entertainment and excellent food. Benihana initiated the style called “Food as Entertainment”. Since 1964 the restaurant has sold over 100 million dishes. In 2003 the first “Benihana” restaurant was opened in downtown Moscow on Pushkinskaya Square, with Rocky Aoki attending its opening. At the heart of the Benihana experience is the teppanyaki table (teppan meaning “steel grill” and yaki meaning “broiled”). Guests gather around this table to enjoy experiencing the meal being cooked right before their eyes by a chef who is not only a great culinary expert but also an entertainer. The meal begins with a delicious Japanese soup and a salad. Both are complimentary. And what Japanese meal could be without its famous green tea (Ryoku cha)?! A waiter tops up your special tea cups (Yunomi) from a green tea pot (Kyusu). Food is prepared right next to the table “teppan-yaki” style. Beef, chicken, and shrimp are prepared “hibachi-style” (an American-style term for “teppan-yaki” cooking). “Hibachi” means “fi re pot”, “small type of grill” in Japanese. Guests, who sit at communal tables, place their orders with the chef and witness a real performance as these items, sliced and diced, are fl ipped into the air. Benihana chefs literally play with your food as they cook it. They also include elements of design, such as making a heart with an arrow out of rice. Interaction and lots of jokes between the chef and the guests are an inalienable part of Benihana experience. You could be asked to help the cook, or asked to tap with your hands on the table into the rhythm of chef’s cooking. Witnessing flying shrimp ending up in a chef’s pocket is one of the most popular tricks at Benihana. To achieve such effects, every cook goes through an extensive training program. There is a specially-designed training program based on manuals translated from Japanese. Waitress training takes up to three months. The star role belongs to the chefs who usually come to work for Benihana from within the company (Rosinter). Theatrical skills and excellent communication skills are mandatory requirements. Theatre aside, the key element that makes this restaurant stand out, is the food. All ingredients used are freshly prepared. No pre-made food is used; everything is cooked right in front of you; with the exception of the sauces. The menu is original – from Benihana in Tokyo. The restaurant management tracks the popularity of dishes by keeping the most popular ones and eliminating the ones that are not well-liked. The menu is regularly updated with new dishes. The big hits of the menu are Combo and Sombo mix. The basis is rice with vegetables mixed with seafood and meat. Benihana wants to make this experience fun for the entire family. Hence the special Kid’s menu. The atmosphere of the restaurant is designed so as make you feel like you are in Japan. As you walk upstairs (as the restaurant is on the 2nd floor of a building) you can enjoy beautiful scenes of Japanese landscapes. The walls of the restaurant are decorated with various paintings of a red flower as well as Japanese characters. The main two colors of the interior are white and red; the colors of the Japanese flag. There are two tables that can host 15 people and six tables for 8 people. The concept that people who do not necessarily know each other sit down together at one table is very popular among foreigners and somewhat unusual for Russia, where people generally prefer to order tables just for themselves or their friends. However, with the appearance of Benihana in Moscow this culture is changing. The entire Benihana restaurant atmosphere implies that there should be people around for you to enjoy the food. Whether you are an expert in restaurant dining or somebody who just wants a good meal, the Benihana experience is something you should try. This restaurant is perceived as a place where you can spend quality time in the company of friends, family and even complete strangers who, by virtue of the magical abilities of the chef will become your fun companions for the evening.